The number of bodies at a single morgue suggest the death toll is far higher than what's been reported. The number of bodies at a single morgue suggest the death toll is far higher than what's been reported. Plus, full coverage of Egypt’s uprising. The wounded began pouring in around 10 p.m. It was only two hours into the young doctor's shift at a hospital in Cairo last night and he was already overwhelmed. "There were gunshots to the head, gunshots to the chest, shots in the eye," says the young doctor. "The victims kept coming and coming." He was so shocked by what he saw that he went down to the hospital morgue to see what was going on. "I couldn't believe my eyes," he says, shaking his head. "There were so many bodies that they had to put two on one bed." The doctor's account, which was also supported in interviews with other medical workers at the hospital, suggests that the widely reported count of roughly 100 people killed nationwide might be much lower than the actual number of victims. The doctor described the horrific scene during his seven-hour shift on the condition that he and the hospital he works in wouldn't be identified. But he showed dozens of gruesome photos and short movies he had taken in the hospital morgue with his mobile phone to back up his account. He personally photographed nine bodies, but after talking to his colleagues in the hospital he estimates that many more bodies were kept at the hospital overnight. All of them were victims of a security crackdown in central Cairo between 10 p.m. and 2 a.m. This afternoon, President Hosni Mubarak appointed his long-time intelligence chief Omar Suleiman as his vice president. Mubarak, who ascended to his current position from the vice president post after Anwar Sadat was assassinated in 1981, had refrained from naming anyone as his No. 2 for 30 years. Now the speculation is over and the choice comes as little surprise: Suleiman had been widely touted as the most likely successor to Mubarak, along with his son Gamal. The choice of Suleiman as vice president also indicates that there's going to be little change in the heavy-handed tactics used by the security forces. Many Egyptians were euphoric at the sight of the army rolling out into the streets last night. But protesters who were in Tahrir Square say the army did little to stop the police from lashing out at them. And now, with Mubarak looking increasingly desperate, things may take a turn for the worse. "In the next days, Mubarak will kill anyone who obstructs him," says the young doctor. "He will be a complete dictator." The gunshot attacks late last night around Tahrir Square may have been carried out by pissed off cops out for revenge. A huge fight broke out between protesters and riot police— the culmination of a long day of smaller cat-and-mouse clashes for control of Tahrir Square around 5 p.m. yesterday. Thousands of protesters massed at the west end of Qasr al Nil bridge and surged across as the riot police scattered. Police boats sped up to the side of the bridge and tried to shoot tear gas into the crowd, often missing. Protesters kept pushing forward shouting Allah Akbar, and dozens of riot cops scrambled into Tahrir Square, joining hundreds of other policemen already positioned there. The cops then regrouped and hit the protesters hard with tear gas, stun grenades, and what sounded like rubber bullets. Back and forth, again and again. There were so many protesters streaming over the bridge by about 5:30 p.m. that there was no going back. They began clanging rocks on a green metal median in the road. The cops continued their barrage of stun grenades with loud booms going off nearly every 10 or 20 seconds at one point. Cops and protesters also got into nasty fights on side roads around the square. Protesters hit riot cops with rocks and were pummeled with batons in return. Some protesters grouped together to drag away their wounded into small shops or the lobby of nearby residential buildings. The crowd was starting to go wild as the sun went down. They lit a car on fire at one entrance of Tahrir Square and torched a nearby traffic policeman's shelter, too. The smell of cordite and tear gas was thick in the air. All of the square was covered with an orange haze from flames and tear gas. The large crowd finally broke up into two groups and pushed into the square simultaneously from two parallel roads on the west side. The cops pulled back into the square, trying to establish a line of control. They couldn't do it. Behind them, in the far east corner of the square, large armored vans skidded and screeched their way out. The riot police beat a hasty and disorderly retreat out of the area on foot, too. It was 6 p.m. and the regime had blinked. "I'm trying to figure out exactly what my role is now," said the doctor. "Go to the hospital and help the victims? Or go to Tahrir Square for the revolution?" That humiliating loss may have precipitated the violence that came later in the evening. Amr Fawzi Kanani, a 31-year-old taxi driver, was one of the protesters in Tahrir Square last night around midnight. The army had already taken up positions around the square but there were also some policemen drifting around. Kanani spotted a policeman about 15 feet away but didn't feel threatened. He was wrong. "He stuck his rifle toward my face and shot me," Kanani said with a groan in his room at the Shabrawishi private hospital today. The right side of his face and forehead are covered in what appear to be wounds from pellets. Blood trickles down from another circular wound on his right bicep. "I want my rights," he says, grimacing in pain. The issue of police abuse has become a highly sensitive topic in the past week. Just how sensitive it's become was apparent soon after Kanani finished his account. The assistant director of the hospital, Khadija Osman, insisted on setting the record straight. Kanani was lying, she said. He had made up the entire story to smear the police. She claimed that Kanani had been attacked by a gang of protesters while driving his car, though she couldn't explain why his wounds were consistent with a gunshot blast. Osman, who was a parliamentary candidate from Mubarak's National Democratic Party, said the police were only out to restore order. Despite a 4 p.m. curfew, thousands of protesters stuck around Tahrir Square and central Cairo tonight. The young doctor from the Cairo hospital was torn. "I'm trying to figure out exactly what my role is now," he said, shortly before curfew. "Go to the hospital and help the victims? Or go to Tahrir Square for the revolution?" 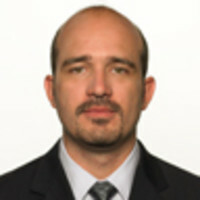 Babak Dehghanpisheh was named Newsweek's Baghdad Bureau Chief in December 2006. He has been covering Iraq regularly for the past five years.